Hi ladies! 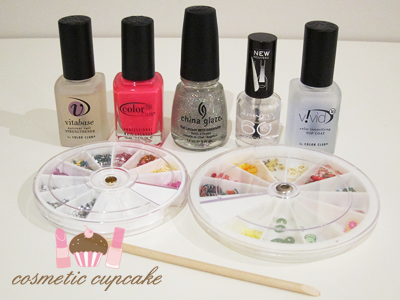 Today I have for you my first proper nail art tutorial! 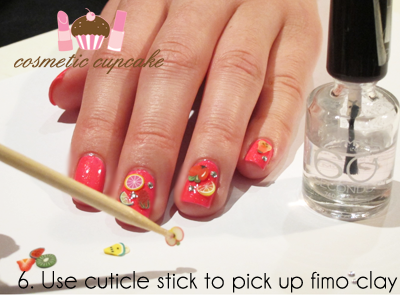 It's a bright, fun and summery fruit salad manicure using the fimo canes I showed you yesterday. We had a week long heatwave here in Sydney last week and I thought these nails would be perfect to compliment the steaming HOT weather! 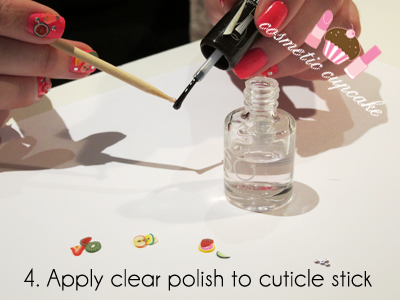 I'm going to show you how quick and simple nail art can be. You don't have to go as crazy as I did with the fimo in my manicure but I wanted something over the top and summery so I went all out =D You can go with fimo on just an accent nail or one or two on each nail, whatever you prefer! 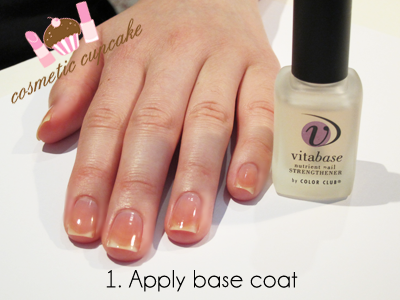 Here I've used one coat of Color Club Vitabase Nutrient Nail Strengthener. I use basecoat for EVERY single manicure I do (except for holos) yet I still have staining. BOO =( Please ignore it. 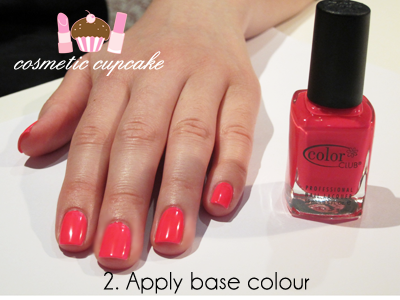 Apply 1-2 coats of your chosen base colour. I'd suggest something bright but whatever you like is fine! Here I've applied a coat of OPI Alpine Snow and then 2 coats of retina searing neon pink - Color Club Jackie Oh!. A big thank you to Rob from Color Club NZ for providing me with my bottle! It is SUCH an awesome colour and my pics don't do it justice as I took my pics at night. It's a REALLY intense bright pink neon, perfect for Summer! One of my patients today suggested I use a black base next time to really make the fimo pop. Someone please try it! I wanted some shimmer so I applied a coat of China Glaze Fairy Dust. This step is optional. At this point in my mani, I like to arrange my fimo slices and rhinestones on a piece of paper in front of me so I can easily grab them to position on my nails. I lay out what I want for each finger in little piles - 10 piles for 10 nails, 2 if I'm only putting fimo on 2 nails etc. I forgot to show you a pic of this but you'll see from the next few pics what I mean. This is so you can pick up the fimo slices to place on the nail. 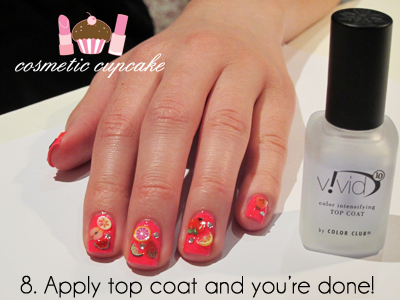 You don't have to use a cuticle stick for this - you can use a toothpick, pencil or anything that has a point. The clear polish can be any old clear polish - it can be your topcoat, anything. I prefer to use Rimmel 60 seconds polish in clear as it works wonderfully for me. My nail art items never fall off and have to be pried off my nails when I remove my polish! 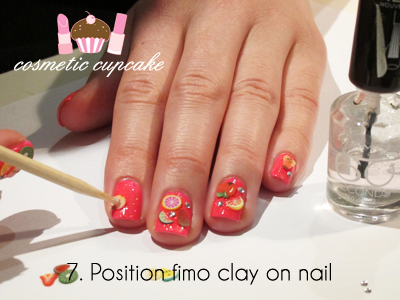 Do this step one finger at a time as you need the polish to be wet to enable the fimo slices to adhere to the nail. You could also use nail glue if you prefer. 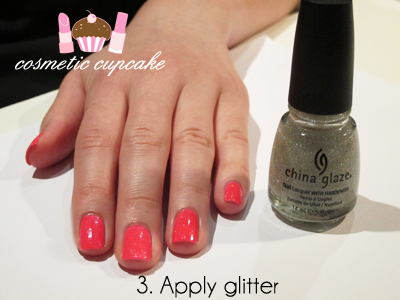 You may need to reapply clear polish to the cuticle stick as you go. Use the cuticle stick or your fingers to help lay the the slices flat on to your nails. Continue adding fimo and rhinestones until you've achieved your desired look. For this mani I applied silver rhinestones but you could use any colour. You could also add some half pearls too! Here I've used 2 coats of my HG topcoat Color Club Vivid Color Intensifying topcoat. I hope you like it and that you'll try my manicure out! What would you like to see next? This was a great tutorial! I recently received some fimo flowers, but I was hesitant to use them! Now I won't be! @Mez: Thanks Mez!!!! They normally do but I was really rough with my hands today so they did chip =( But the fimo slices didn't fall off though! @BellasUnhaseCia: Thank you so much! @SuGaR: Definitely pick yourself up some fimo sticks! @Ivana: Awww thank you for your sweet comment Ivana! I'm glad you like the mani! @Jess: Awww I'm so happy you found the tutorial helpful! Yup definitely no need to be hesitant to use them =) Can't wait to see how you use them! Thanks so much for posting this! I have so much femo lying around and I can't find a mani I REALLY like using it- but this is PERFECT!! Super cute, can't wait for summer here! AMAZING!! Absolutely gorguz huny! And I'm sooo very glad you did this tutorial... lol! :) can't wait to get going with those fimo canes! Thank you so much sweety! I love this! I always see the fimo slices at stores but I wasn't sure exactly how to use them so this really helped. I really like the fruit, and now I'm going to have to go buy some! I also love your ring! Your tutorial turned out beautifully! So cheery and summery. I agree that a black base could be very striking; usually I see fimo (especially fruit) used on bright, warm colours. Great tutorial! It looks really simple but the results are so adorable and pretty. This looks so freaking cute XD Love it!!! WOW you are sooooo talented. I absolutely love this look. I think you have just given me a new addiction ...... FIMO. Do you have some recommendations on where to buy the sticks? Keep up the good work beautiful! I bought some fimo clay last year but I've still yet to use them. 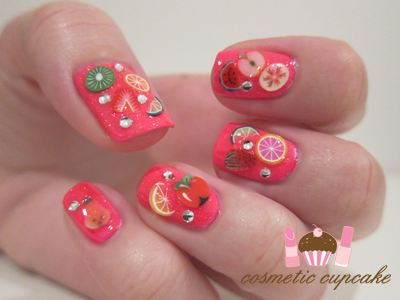 Fruity nails are definitely very summery and you're take on them are so girly too - perfect for Valentine's Day =] haha and omg last week's heat wave totally melted me ahahaha!! @Rachel Marie: I'm glad I could give you an example of how to use it Rachel! I find fimo soooo much fun. @Spaceinvaders: LOL I don't think they would take very good. @Danielle: Thanks Danielle! Not too long until Summer comes for you ;) I wish Summer would hang around for longer! 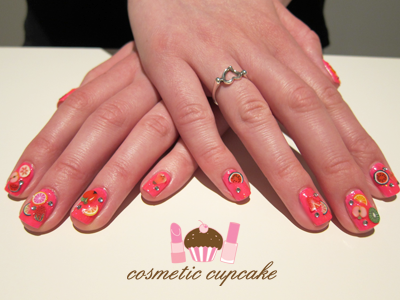 @Jette Fromm: I'm glad you think so =) I got some looks from my workmates with so much colour on my nails lol. @ameliaadelle: I'm glad my tutorial is useful for you! Hopefully it'll give you a little idea of what you can do - the designs are endless! Definitely get some fruit ones, as I said they are my fave and the ones I use the most. @Freshie: I try to cut them as thin as possible and also press them down after I've applied them on the nail. They can be tricky to use sometimes! @Danielle: Thanks Danielle! =) I never even thought to use it on black so I was pleasantly surprised by my patient's suggestion! @Angela: Cheers Angela! Thanks for stopping by and commenting. @Jade: Awwww thank you Jade! @Kimmi: You make me blush Kimmi! Fimo can definitely be an addiction. I've spent hours searching for particular designs x) You can get them on eBay or also on Born Pretty Store! Hi there, this is Tammerly from Pink Diva's Beauty Spot... this is my first visit to your blog and I love it! 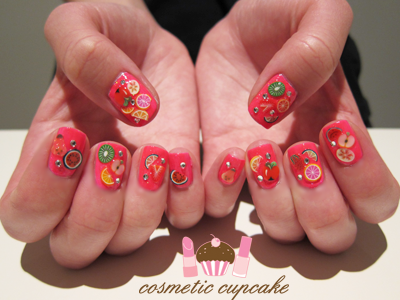 You are soooo clever with nail art, how do you find the patience? It does my head in just painting my nails alone haha! Wow thanks for these two tutorials. They where great and really made me want to try it out. Very easy to understand, although it is much more difficult when you try it. It looks so nice on your nails. Ahhh, this is seriously amazing! real nice! i can't wait to try out my fimos! These are so cute! :) I got inspiration from these nails and will post my notd later today. A lovely package from Aysh!